Data supplied to BODC were accompanied by data quality notes from the Originator that detailed observations made when the data were processed and subsequent processing decisions. A summary of these notes have been provided in the tables below. Sea-Bird MicroCAT 05434 5 m None, CTD comparison checks revealed these data to be of good quality with the calibration CTD casts performed approximately 300 m from the mooring after mooring deployment and less than 200 m from the mooring before recovery. Star-Oddi minilogger 02842 7.5 m A temperature offset of -0.1°C on deployment and 0.05°C on recovery were found. No corrections applied. Sea-Bird MicroCAT 04966 10 m None, CTD comparison checks revealed these data to be of good quality with the calibration CTD casts performed approximately 300 m from the mooring after mooring deployment and less than 200 m from the mooring before recovery. Star-Oddi minilogger 02843 15 m A consistent temperature offset of -0.02°C was found. No corrections applied. Sea-Bird 16+ SEACAT fitted with Seapoint Turbidity Meter #10320 04736 Located on seabed There were no recovery CTD to check against instrument drifting. The originator recommends that these data are used with caution. Teledyne RDI 600 kHz ADCP 2390 Located on seabed To correct for the magnetic declination (difference between magnetic north and true north) latitude values were changed by -3.2783°. All latitude values were modified by 1.4312° to correct for the compass error. Sea-Bird MicroCAT 05792 5 m None. Star-Oddi minilogger 02852 7.5 m A temperature offset of -0.03°C was found when these data were compared with the data recorded by the Sea-Bird MicroCATs also present at this site. An offset correction of +0.03°C has been applied to these data. Star-Oddi minilogger 02844 15 m A temperature offset of -0.03°C was found when these data were compared with the data recorded by the Sea-Bird MicroCATs also present at this site. An offset correction of +0.03°C has been applied to these data. Sea-Bird 16+ SEACAT fitted with Seapoint Turbidity Meter #10538 04738 Located on seabed None. Teledyne RDI 600 kHz ADCP 5806 Located on seabed To correct for the magnetic declination (difference between magnetic north and true north) latitude values were changed by -3.3863°. All latitude values were modified by -9.8444° to correct for the compass error. The Workhorse Sentinel is a self-contained ADCP that can be used either on a mooring or mounted in the hull of a moving vessel. Its 4-beam design provides a redundant data source (in case of a blocked or damaged beam), an independent data quality measure (error velocity) and reduces the variance in data, thereby improving data reliability, quality and accuracy. Real-time data can be transmitted to shore via a cable link or acoustic modem or they can be stored internally. Sensors for bottom tracking, pressure and directional wave measurements can be added to the instrument and a special casing is available for deeper applications. Two mooring sites were maintained for the duration of the Liverpool Bay Coastal Observatory project. Moored instruments present at Site A (also known as Site 1/9) through the entire data collection phase of the observatory. From 05 April 2005 (Cruise PD11_05) moorings were also present at an additional Site B. From April 2005 until December 2009 mooring Site B was located at Coastal Observatory Station 20. The moorings were moved to Station 21 from January 2010, where they remained until the end of the observatory. The raw ADCP data were processed using the standard RDI software bblist which resulted in the creation of two files, the first containing the current velocities separated by bin depth and an auxiliary file containing the variables heading, pitch, roll, temperature and pressure. The variables present in the auxiliary files were only used for quality control purposes with the exception of pressure, which was used to calculate sea surface height taking into account the latitude and the height of the transducer head above the seabed, which was estimated to be 0.7 m. Sea surface height and the current velocity data were then combined into one file. Before the data were supplied to BODC, some quality control procedures were performed by the Data Originator. First the Originator corrected the latitude values to take into account the difference between magnetic north and true north (magnetic declination). The Originator also corrected the latitude values for compass error caused by localised magnetic fields such as the ADCP frame and battery, using HF radar data recorded by two HF radars located at Abergele and Formby as a reference. Once compass errors for all ADCP series recorded at Site A had been calculated, a mean of all errors was taken. As the ADCP compass error is a random error, the expected mean of all errors is approximately 0°, however the Originator found that the actual mean compass error was approximately 5.3°. All compass errors were therefore modified by 5.3°. The compass error values given in the Originator's data processing documents have taken this adjustment into account. The bins recorded above the sea surface were then converted to absent data indicators by the Data Originator. If there were any problems with the pressure data recorded by the ADCP, then data from another instrument attached to the same frame was used instead. If no pressure records were available, then backscatter intensity was used to calculate the sea surface. The top three bins have been removed in all series to remove noise in these data caused by side lobe contamination. A more detailed explanation of all of the quality control procedures performed before the data were submitted to BODC can be found in the Originator's ADCP quality control methodology document. Prior to cruise PD33_08 the data originator had been correcting the mid-water current velocities to account for contamination caused by the recovery line attached to the ADCP lander frame. The mooring design was changed from PD33_08, and this redesign successfully eradicated the beam contamination issues that had affected previous deployments. Therefore, no three-beam correction has been applied to these data. This issue is explained in detail in the originator's ADCP correction report, however as previously stated no three-beam correction was applied to these data. Finally a visual inspection of the data was carried out to find any obvious errors which had not been corrected by the previous quality control checks. Sustained, systematic observations of the ocean and continental shelf seas at appropriate time and space scales allied to numerical models are key to understanding and prediction. In shelf seas these observations address issues as fundamental as 'what is the capacity of shelf seas to absorb change?' encompassing the impacts of climate change, biological productivity and diversity, sustainable management, pollution and public health, safety at sea and extreme events. Advancing understanding of coastal processes to use and manage these resources better is challenging; important controlling processes occur over a broad range of spatial and temporal scales which cannot be simultaneously studied solely with satellite or ship-based platforms. 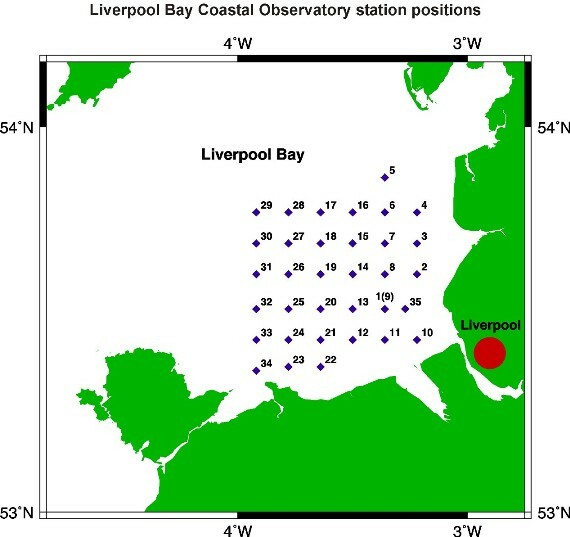 Considerable effort has been spent by the Proudman Oceangraphic Laboratory (POL) in the years 2001 - 2006 in setting up an integrated observational and now-cast modelling system in Liverpool Bay (see Figure), with the recent POL review stating the observatory was seen as a leader in its field and a unique 'selling' point of the laboratory. Cost benefit analysis (IACMST, 2004) shows that benefits really start to accrue after 10 years. In 2007 - 2012 exploitation of (i) the time series being acquired, (ii) the model-data synthesis and (iii) the increasingly available quantities of real-time data (e.g. river flows) can be carried out through Sustained Observation Activity (SO) 11, to provide an integrated assessment and short term forecasts of the coastal ocean state. East Mooring Site: Bottom frame with full suite of physical measurements (high frequency Acoustic Doppler Current Profiler (ADCP), conductivity, temperature, turbidity and fluorescence), a Centre for Environment, Fisheries and Aquaculture Science (CEFAS) directional wavebuoy, and a CEFAS Smartbuoy collecting surface properties including salinity, temperature, turbidity, nutrients, irradiance and chlorophyll. All transmit data in real-time via Orbcomm. The Smartbuoy also collects daily water samples. West Mooring Site: Bottom frame with full suite of physical measurements (high frequency ADCP, conductivity, temperature, turbidity and fluorescence), CEFAS Smartbuoy. Spatial Survey: Four - six week intervals (determined by biofouling of optical sensors). Spatial surveys comprise of vertical profiles of CTD, suspended particulate material (SPM), some bed sediment sampling and surface and bed nutrients, phytoplankton, zooplankton. Ferry: The Birkenhead - Belfast ferry samples near surface (5 m depth) temperature, salinity, turbidity, chlorophyll, with data transmitted by Orbcomm. The route is scientifically varied passing through six completely different hydrodynamic regions, which significantly impact on their ecological function. Tide gauges: Real-time data are obtained from tide gauges operated by Mersey Docks and Harbour Company (MDHC) and the UK tide gauge network. Satellite imagery: Weekly composite satellite data, Advanced Very High Resolution Radiometer (AVHRR) sea surface temperature (SST) and ocean colour (chlorophyll and suspended sediment), are provided by the Remote Sensing Data Analysis Service (RSDAS) based at Plymouth Marine Laboratory (PML). HF radar: A phased array HF radar system (a 12-16MHz WERA HF radar) measuring surface currents and waves with maximum range 75km at a resolution of 4km for sea surface currents and for 2-D wave spectra. Operational models: The Coastal Observatory uses Proudman Oceanographic Laboratory Coastal Ocean Modelling System (POLCOMS), which is part of Oceans 2025 Theme 9. The rig was deployed at Coastal Observatory Site A on 02 December 2009 during RV Prince Madog cruise PD47/09 and recovered on 20 January 2009 during RV Prince Madog cruise PD02/10. This rig is a bottom frame comprising of the following instruments 0.5 m above the seabed: RDI Acoustic Doppler Current Profiler (ADCP); Sea-Bird 16plus; an additional Sea-Bird 16plus providing logging and power for an Aanderaa oxygen optode; and a SonTek ADV (Acoustic Doppler Velocimeter).The frame was fitted with a fizz link, a spooler with 50 m of rope for recovery of the ballast weight and two Benthos releases. RDI 600 kHz Waves ADCP 2390 Horizontal current velocity components. Vertical current velocity components. Sea surface height Sound velocity calculated from temperature, depth and salinity of 32. Fitted with a pressure sensor; hourly wave recording enabled. Includes Aanderaa Optode S/N 674. us. No data from this instrument has been provided to BODC. For more information about the instruments please see the cruise report for PD47/09. The position of this station relative to the other POL Coastal Observatory sites can be seen from the figure below. The CTD instrument package for these cruises was a Sea-Bird 911plus, with beam transmissometer, fluorometer, LICOR PAR sensor, LISST-25, and oxygen sensor.